As expected, the markets bounced back early last week, but trading volume was lacking. Prices retreated on Thursday, and with most of the indexes below key moving averages and even more institutional selling, the overall market outlook remains in a downtrend this week. The Russell 2000 continues to lead markets lower, falling below it’s 200 day moving average and entering bear market territory. That’s no the best sign, considering that market leading stocks are typically small capitalization stocks. The DJIA remains the last man standing, so to speak. But even it couldn’t withstand the selling, closing below it’s 20 day moving average last week. The Nasdaq, S&P500, and NYSE all being this week below their respective 20 and 50 day moving averages. 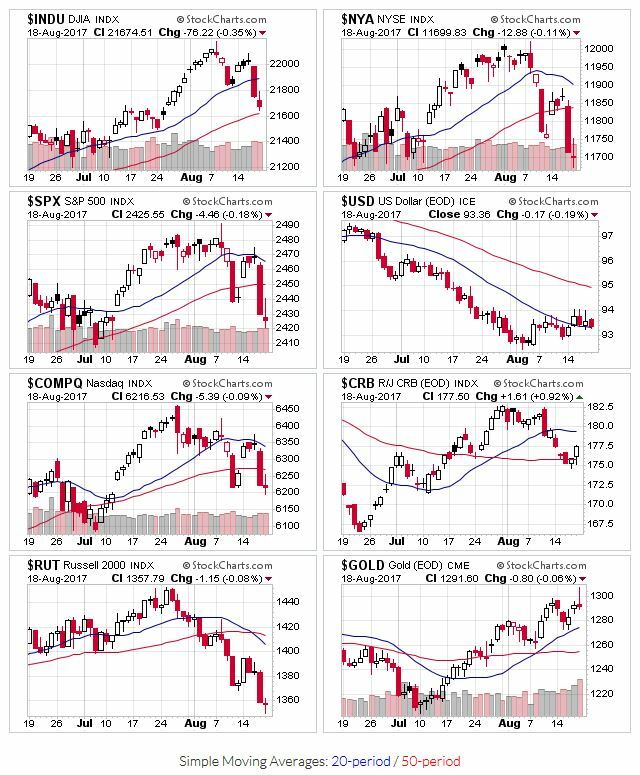 The market indexes added another distribution day or two, along with some stalling action (large price spread, low closing price), so the downtrend signal remains in place. OEW switched over to a downtrend. If past is precedence, the downtrend should end soon, as declines during this bull market have been short-lived after an OEW confirmation. Continuing the recent trend of after-hours price declines (see here and here), last week it was Walmart’s turn to get “Amazoned”. On the positive side, WMT’s price volatility was nowhere near as bad as what we witnessed with NVDA. Most of the growth names that made my selection screens over the past few weeks have experienced: outright base failures, low-volume breakouts that subsequently failed, or are in the process of forming base-on-base patterns. If you’re sitting on profit, remember that you never want a gain to turn into a loss. Book some of your profits (>20% gain). Not quite there? Take a serious look at your stocks chart and set some short term triggers. If we are entering a correction, it’s a great time to look for stocks that are already forming bases and don’t get derailed by market sell offs. These stocks will be the ones that lead the market higher when the correction completes.